..and a special thank you for those who helped in 2009 in such economic difficult times for so many where the good-will and excellence of the musicians and their music made life a little lighter and happier. In memorandum of Mikio Abé who died on Christmas Day 2008 after an all too brief friendship. There were over 60 concerts organised as part of our expanding classical music programme including many Japanese musicians as well as those from other worlds. President:- Shakti Hon Patrons: Dame Evelyn Glennie DBE, Prof. Tomotada Soh (Hon RAM), George Logan (Dr Evadne Hinge). not forgetting Lord Bath now retired Patron. Web Site Organiser:- Phil Ronan – Brilliant! 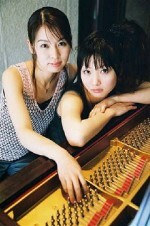 High Spots:- The High Sheriff of Bristol’s Charity Concert on June 12th where pianist sisters Sayaka and Aska Matsumoto played backed by a 45 piece orchestra and did their country proud and the society. No little thanks to Dr Chamber (High Sheriff), Jake Olver, Peter Stark (Conductor), Roger Huckle (Leader). Fantastic! Meeting legendary Marimba / Percussionist Keiko Abé and hearing her at the RAM. Wooden Spoon:- Japanese ‘Diplomats’ / Funding Organisations generally – and representatives of the Embassy of Japan and for ignoring an invite and reminders to the High Sheriff’s Concert at Bristol Cathedral June 12th and for three Embassy of Japan Representatives visiting an Art Gallery in London to view one ‘cartoon’ painting by an Englishman from a photo taken on a Tokyo Tube. Japanese Heroes:- The Japanese Electorate for kicking out ‘deadwood’ that shamed them. Piano:- Brian Benedict, Masachi Nishiyama, Kanae Furomoto, Kumi Matsuo, Wakako Kamiyama, Shin-Jung Lee, Kiyoko Fukuo, Simon Callaghan, Yukino Kano, Nia Williams, Yukie Wake, Philip Howard, Jelena Makarova, Koichiro Honda, Daniel Smith, Emiko Miura, Miriam Leskis, Yukiko Shinohara, Chisato Kusunoki, Prach Boondiskulchok, Patricia Capone, Akiko Murakami, Emiko Miura, Tadashi Imai, Makiko Sada, Sayaka & Aska Matsumoto, Yuki Kumagai, Jan Karl Rautio, Wai-Yin Lee, Kio Takahashi, Akiko Kumakura. Posted on Friday, January 29th, 2010 at 3:50 pm, and filed under Reviews. You can follow any responses to this entry through the RSS 2.0 feed. Both comments and pings are currently closed.